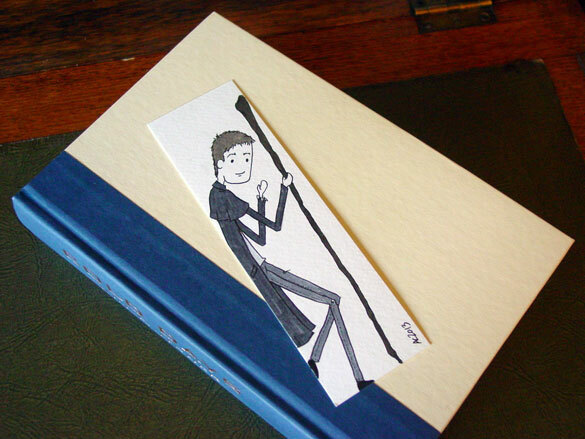 After I posted the other Dresden bookmark I’d done as a gift for a friend, one of my regular patrons gave me puppy eyes asking to do one for her, too. 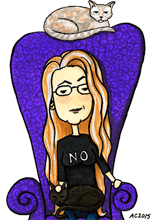 I’m working my way up to another Bookmark Week, so I drew this up for her the other day. It’s already sold, but the ones I post in a few weeks will be available to those without puppy-eye privileges. If you want to be first on the list to see which ones are coming out, you can join my mailing list here. 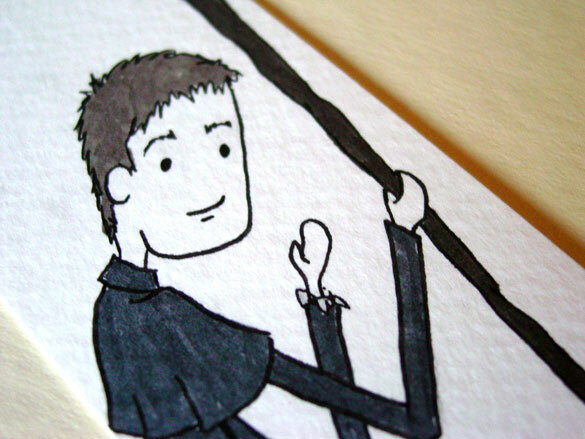 Dresden Bookmark 2, 2″x7″ pen & ink and Copic marker on cardstock, nfs (sold). Above, you can see a close-up of Dresden’s sheepish little face, like, “Oh hey didn’t see you there.” Below, you can see him hanging out with my copy of Cold Days.